UConn Women Win Historic 100th Game In A Row : The Two-Way As of Monday night, the last time UConn lost a game was 818 days ago — in November of 2014, when Stanford beat them in overtime. 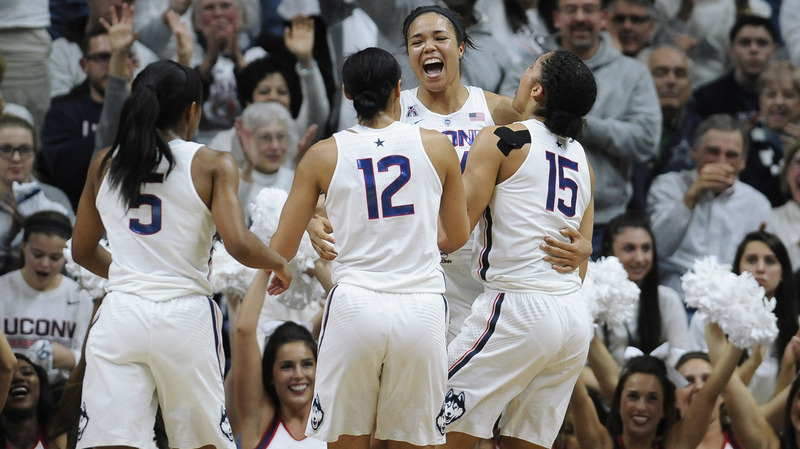 Connecticut's Napheesa Collier, (center) celebrates with teammates (from left) Crystal Dangerfield, Saniya Chong and Gabby Williams in Storrs, Conn., after beating South Carolina 66-55 — the Huskies' 100th win. Pushing their win streak to a new level — triple digits — the University of Connecticut's women's basketball team achieved a milestone Monday, beating No. 6 South Carolina, 66-55, for their 100th win. No other basketball team, male or female, has neared the mark in the NCAA. As of Monday night, the last time UConn lost a game was 818 days earlier — back in November of 2014, when another No. 6 team — Stanford — got the better of the Huskies in overtime. That was a road game for UConn; last night's game was a home win, and former Huskies stars such as Sue Bird, Maya Moore and Breanna Stewart turned out to watch Coach Geno Auriemma's latest run at history. Putting the team's feat in perspective, Christine Brennan of USA Today tells Morning Edition that the only attainment left for UConn to pursue might be the one that Wayland Baptist University set in the 1950s, when they won 131 straight. "That was in the days of the AAU," Brennan says, "so I guess UConn has one more streak to go." She notes that the legendary UCLA men's team under John Wooden won 88 games in a row. "Bottom line," she says, is that in the NCCA, "no one's ever done this." Two of UConn's four consecutive national championships happened during the streak. More than a quarter of their 100 wins came against ranked opponents, the NCAA says — but only two games ended with a margin of fewer than 10 points. "There haven't been too many stressful games for the Huskies faithful to watch," the NCAA adds. In last night's game in Storrs, Conn., South Carolina worked to slow the pace and keep the game close in the first half and trailed by only three points in the third quarter. But the Huskies responded with stifling defense and strong rebounding to build on the 35-29 lead it had amassed at halftime. And even though UConn's leading scorer, Katie Lou Samuelson, being held to under 10 points, junior Gabby Williams stepped up with a career-high 26 points and 14 rebounds — along with four steals and two blocks — to help the Huskies reach the 100-win mark.